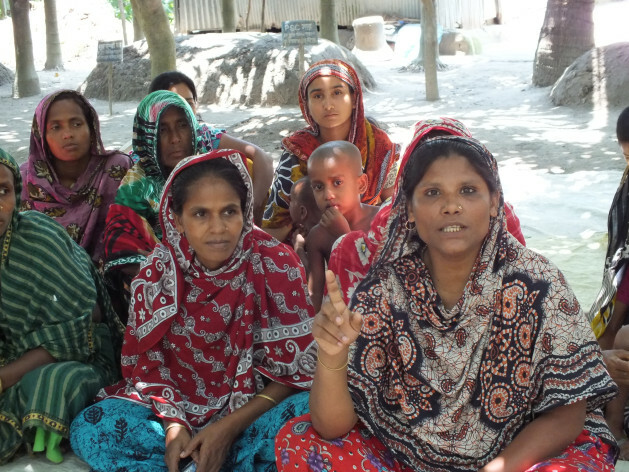 Anisa Begum (right) I among countless women leading a green revolution in Bangladesh. Credit: Naimul Haq/IPS. DHAKA, Nov 5 2013 (IPS) - On a hot and humid day in northwestern Bangladesh, Anisa Begum sits with a group of 25 homemakers, explaining how to use natural fertilisers to increase grain yield. The 47-year-old mother of two tells them if men can grow crops and make money, so can women. She is a leader of the Common Interest Group (CIG) that brings together women who want to take up farming in this South Asian nation. Begum has got hands-on training from the local agriculture office on how to maximise crop yield from natural fertilisers. She and nine other successful women farmers last year visited Vietnam, a country known for its efficient grain harvest. “This is a wonderful feeling,” a smiling Begum tells IPS, standing at the courtyard of her home in Islampur village in Rangpur district in northern Bangladesh. This year she has trained a dozen or so fellow CIG members in the Pairabond area of Rangpur, 255 km from the Bangladeshi capital Dhaka, and says an increasing number of women have been showing interest in new and improved farm practices. The CIGs, formed with the help of local agriculture offices, are part of a programme to enhance farm productivity for food security in Bangladesh – the National Agriculture Technology Project (NATP). The areas in greater Rangpur region are known for good quality grains and vegetables, thanks to the soil quality. The nation depends on the farmers of this region for high quality grains and other farm produce. But traditionally women have been more involved in household work than agriculture. A study titled ‘Economic contribution of women in Bangladesh’ reveals that just about 21 percent of women in rural areas are directly engaged in agriculture compared to 78 percent of men. The study was carried out in 2008 by the Bangladesh Bureau of Statistics with several partners. So the idea behind the free training to women was also to encourage small entrepreneurship in agriculture. The local agriculture office has been very supportive. Through the CIGs, women learn new technologies such as cultivating drought-resistant and high yielding aromatic rice, vermicomposting and planting all-season tomato seeds that keep the crop free of the leaf curl disease. Rowshan Ara, a successful woman agriculturist in Pairabond, tells IPS: “When the demonstrations began in Islampur village, there were hardly any women who showed an interest in agriculture. Before joining the CIGs, many of the women used to be farm labourers, earning as little as Taka 70 (88 cents) a day for 10 hours of physical labour, cultivating and harvesting rice. A woman farm labourer, depending on the season and the size of the cropland, can make a maximum of Taka 1,500 or 20 dollars a month. Increasing participation in agriculture has changed things. A woman can now earn anything between Taka 5,000 and 8,000 (64 dollars and 100 dollars) a month by growing fine quality grain that is in great demand abroad. Vermicomposting has become very popular as farmers reap rich benefits from a healthy soil. It is cheaper than chemicals (less than 25 cents a kg). Producing pest free seeds at home is another popular practice. Sarkar made over 380 dollars from the sale of natural fertilisers in the first quarter of this year. The income was in addition to the 90 dollars her husband earned from hard labour harvesting crops. A growing number of women have been joining the CIGs. From less than 20 such groups in Mithapukur in 2009, the number has now gone up to more than 240. Such efforts to boost national food production are designed and jointly funded by the World Bank, International Fund for Agriculture Development (IFAD) and the government in a 82.6 million dollar project known as the National Agriculture Technology Project (NATP). Adopting new technology in agriculture has had tremendous impact. Retailers, brokers and wholesalers prefer to market natural fertiliser-based vegetables and grains as they are cheaper compared to crops grown with chemical fertilisers. I think that the government and the men of the households should do all they can to encourage the women to learn how to farm to raise crops that will put dollars into their household. There is no reason why men should object. Women instinctively know how to multitask within their homes, juggling chores of homemaking and child rearing. The fact that they have already gotten as much information as they have, and that they are meeting together to discuss the project at hand, plus gaining insight from local wholesalers in their district, shows determination and willingness on the part of the CIGs members to give this project a chance in order to secure a better future for their families and their country. I wish them the best and much success in their endeavors.